Mark Bittman has so many wonderful minimalist recipes and one my favorites is a tomato jam that I adapted slightly and added a little spice and a roasted robust tomato flavor. On a dreary rainy day dedicated to winding yarn I have two of his recipes in the making and my first will be served tomorrow with a fresh batch of biscuits. With an abundance of tomatoes of several varieties, I thought about making a blend of tomatoes, but ultimately decided to use the 2 pounds of Roma tomatoes and to roast them before continuing with the stove top reducing. Place 1-1/2 pounds of sliced Roma tomatoes into a baking dish, sprinkle 3/4 cups sugar over the tomatoes, add the zest of 1 small lemon zest, 1 tablespoon lemon juice and season with about a teaspoon of kosher salt. 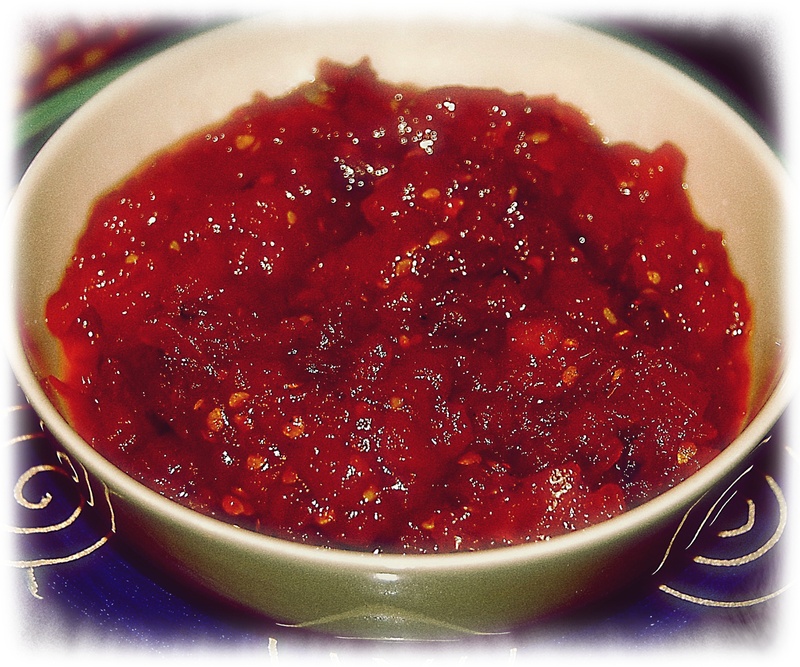 I tossed in 2 small dried chili pequin and about 1+1/2 teaspoons diced canned chipotle pepper. Roast in a 375º oven for about 45 minutes stirring them from time to time. When done allow to sit a few minutes and add the tomatoes to a small saucepan, season with tablespoon minced ginger, 1 teaspoon ground cumin seed, 1/4 teaspoon ground cinnamon, 1/8 teaspoon ground cloves. *Be careful with your hot and spicy additions, everyone doesn’t love hot! Serve with big fat biscuits and other things!